When it comes to VCarving the most important thing to get right is the angle of your cutter. This is something that you would think is easy, and it is so long as you don't fall into the trap. Not all Vbits are created equal and sometimes the angle you buy is not the angle you get. 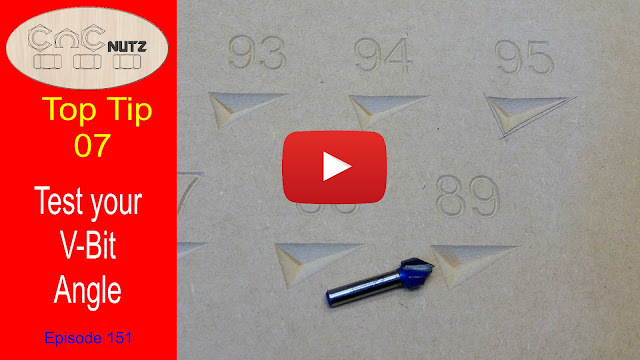 remember that a lot of these router bits are not precision bits and are designed to be used on handheld router sot cut grooves and bevel edges on projects. Their angle is nominal and if used for their intended purpose are more than adequate. Along comes VCarving and the story is different. A difference of 1 or 2 degrees will have an effect on your Vcarved project and range from, things will not look right to, good greif that looks hideous. The bigger the angle error the worse the final project will look. Worse than this you start looking for the culprit and think of everything from lost steps to calibration errors and before you know it the machine is in pieces and you arelooking for a red herring. The answer is simple. Test your cutters and make sure the angle is right before using them the first time. You only need to do this once for each cutter as its angle won't change throughout its working life. A bit of scrap MDF and in no time flat you will know how good that Vbit you bought really is. A big thanks to Paul Z who 10 years ago posted in the Vectric forum and shared a technique for testing Vbit angles. It was seen and remembered by a CNCNut who was new to the hobby and was learning the black art of VCarving. The original thread can be seen here. The concept that this works on is very simple and clever. We make a file that contains a multitude of cuts and each has a different angled cutter defined for it. When the angle of the router but matches the angle of the cutter defined in VCarve Pro then the triangle will look right. If the angle is wrong then the sides of the triangle will either bow in or out depending on whether the cutters angle is larger or smaller than the defined angle. In the example below the angle of the cutter is 90 degrees and so the sides of the 85 degree triangle bows out. And using the same router bit the 95 degree triangles sides clearly bow in. Choose the tringle that looks correct and ou will know your cutter angle. I have provided files to cover 3 common cutter angles. Please note that that the 90 and 60 degree Vcarve files are configured for a 1/2" (12.7mm) cutter while the 45 degree file I have defined a 1/4" (6.35mm) cutter. Thank you for the great videos and advice! I can't get the DXF files to open. I'm trying to get the files converted to SVG (which I can use universally), because everything I'm trying to open these with tell me to convert them to AutoCAD 13 or later. Any way you could get these into SVG Pete? Thanks!! !